This plant was iffy when it arrived but once I followed the instructions it grew hardy. The cranes bill geranium features dissected leaves, and it grows up to 12-inches high. This plant blooms from May to July with small five-petal purple flowers. Each of these woodland plants has a pod on it containing a seed attached to the plant through a unique structure resembling a crane's bill. Once the unique structures dries, the seed is catapulted onto the ground where it uses its tail-light structure and the force of the wind to attach itself to the ground. The woodland geranium does well in a variety of lighting conditions ranging from full sun to partial shade. This geranium prefers dry to medium-dry soil. 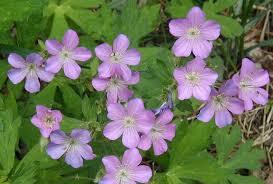 Wild Geranium can be produced into essential oils and ointments, and have a lot of uses. It can be used as an antibacterial ointment and can also be used as an antioxidant and also as a natural laxative when needed. The plants contain myricin, tannin, albumen, lignin and even the spline. A herbalist knows how to create these into oils that are helpful for medicinal purposes. The cranes bill geranium is a herbaceous perennial that is native to Northeastern North America. This plant blooms a pale pink, deep pink, or showy lilac flower in the spring. 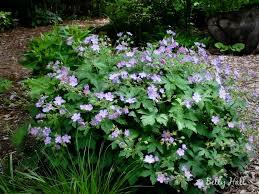 The Geranium attracts butterflies and tolerates rabbits and deer. They prefer to be planted in moist soils that are well drained. These plants are great when added to large containers for porches, patios and also to decorate a pool area. They usually bloom during the early part of summer and the latter part of the spring months. They look amazing when several are planted together and bloom at the same time in a garden. This is a beautiful way to bring lots of bright and vivid color as they are thriving. These plants can have gorgeous green leaves that display the beautiful blooms, and the leaves can grow to become around five inches long and also five inches wide. These are high plants because they grow very quickly and paints a beautiful picture in a garden area. They are also very easy to grow and care for as they take very little maintenance to get these beautiful plants to build.